Hurricane Harvey's environmental impact on Greater Houston was sweeping: The area’s many industrial facilities emitted millions of pounds of excess air pollution, and floodwater swamped highly contaminated Superfund sites, carried bacteria into schools, homes and businesses and left behind prolific mold. The historic storm, which forced tens of thousands of Houstonians to flee their homes, also clearly inflicted a heavy emotional toll. But the precise impact on the population's physical and mental health so far has been largely anecdotal. An information-gathering initiative unveiled Wednesday by Rice University, the Environmental Defense Fund and the Houston Health Department seeks to better quantify it. The Hurricane Harvey Registry will collect responses to an online survey that asks Houston-area residents about where they rode out the storm and their health condition — physical and mental — before and after. 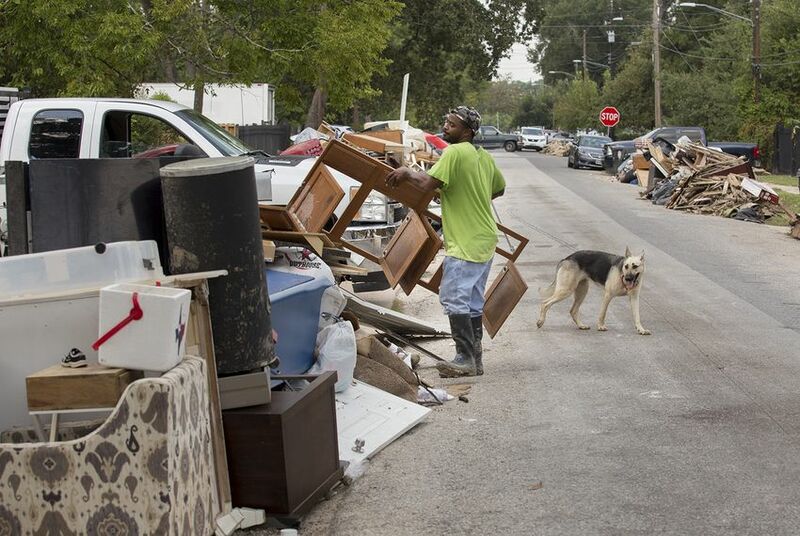 "This will help researchers predict continuing ailments from the Harvey floods — and health problems from future storms," Houston Mayor Sylvester Turner said at a news conference Wednesday. "Pollutants released by the floods — mostly at chemical plants and other facilities outside city limits — may cause long-term health issues." Rice University Provost Marie Lynn Miranda, the project's lead investigator, said in an interview that researchers are hearing anecdotal reports of increased respiratory problems and "the toll of stress among people who were displaced." But, she said, "We don’t want to make decisions by anecdote — we want to do evidence-based decision-making." Rice researchers and city officials say they will use the information to target lingering health concerns, pinpoint vulnerable communities — cross-referencing known pollution releases with reported health problems — and better prepare for the next storm. "Without the data, we’re really not going to be as effective at mitigating health effects," said Rice professor Loren Raun, who also serves as Houston's chief environmental science officer. Registry officials are encouraging even Houstonians whose homes didn't flood during Harvey to respond to the survey. The National Institutes of Health, the Cullen Trust for Health Care and the Environmental Defense Fund funded the creation of the database. It is modeled after the World Trade Center Health Registry, which sought to track the health effects of the Sept. 11, 2001, terror attacks, but is also “the first of its kind to collect information about environmental exposures after a major flooding event,” according to a news release. The survey, designed to take no more than 15 minutes to complete, asks respondents for some sensitive personal information, but registry officials say that information will be stored on secure servers accessible only to researchers for Rice's Children's Environmental Health Initiative and released publicly only in aggregate form. Respondents can also choose to skip certain questions. Houstonians without internet access will have a hard time completing the survey — it's online only — but Environmental Defense Fund spokesman Matthew Tresaugue said the project team plans to send representatives to public events to enroll potential respondents and distribute bookmarks with bar codes and the web address to guide people to the site. The registry will accept responses on an ongoing basis, with no cutoff date. But Tresaugue said entities involved in the registry may share general insights from the survey later this year. Disclosure: Rice University and the Environmental Defense Fund have been financial supporters of The Texas Tribune, a nonprofit, nonpartisan news organization that is funded in part by donations from members, foundations and corporate sponsors. Financial supporters play no role in the Tribune's journalism. Find a complete list of them here.